When searching for available shoes in your size use the 'Fit' option in the search filters (see image below). Because some of our shoe models have French sizing and some have Italian you will need a 1/2 size larger in the French sized models. For example, if you wear a 7 in US sizing, you will generally be a size 37 in our 'True to Size' Italian sized models. 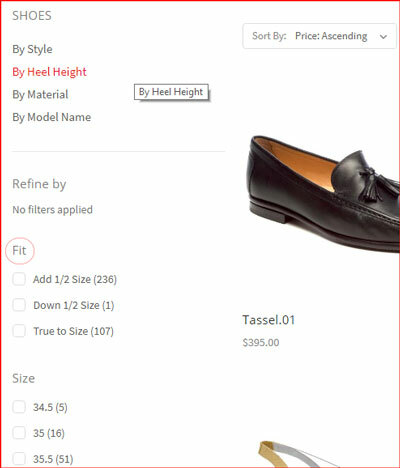 To search for available shoes in your size for these Italian sized models, you would select the 'True to Size' option in Fit and the '37' option in Size. 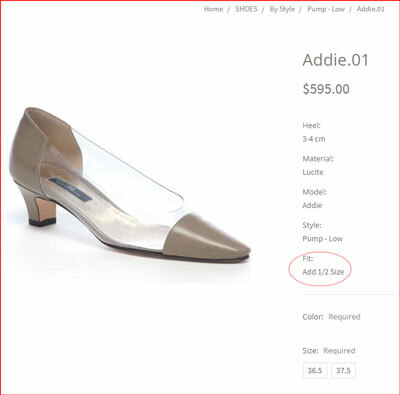 To search for available shoes in the French sized models you would run an additional search selecting the 'Add 1/2 Size' option for Fit and the '37.5' option for Size. When viewing the details for a shoe the Fit type will be listed for each shoe (see example below). If your US size is 7, then the 37 will be the correct size for a shoe with Fit listed as 'True to Size' while 37.5 will be correct for a shoe with Fit listed as 'Add 1/2 Size'.